My favourite vegetable of all times-Sweet Potato. Roast them with a bit of ground chili and salt, I am happy with just that and some spinach leaves 🙂 Is it weird to have salads without dressing? I hate how dressing changes the taste of vegetables. I add some spices to vegetables, usually roast them and make a salad. 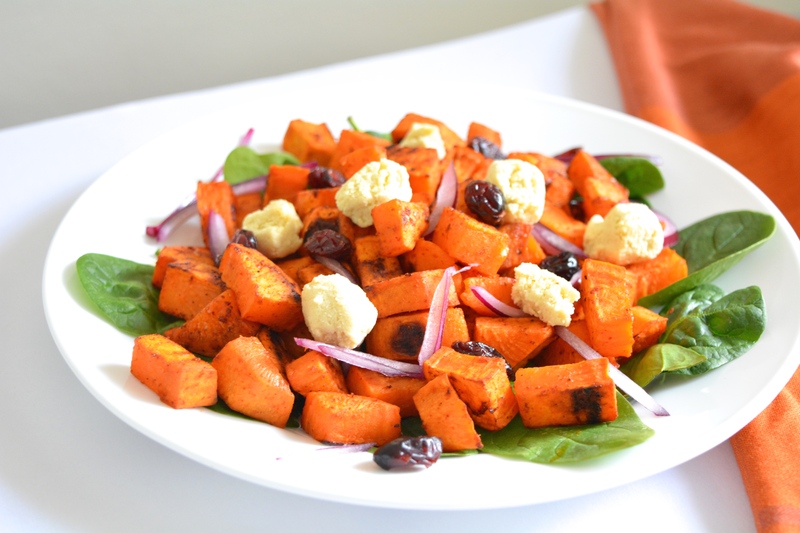 After the success in making my own homemade almond feta cheese, I made this ultimate roasted sweet potato salad. 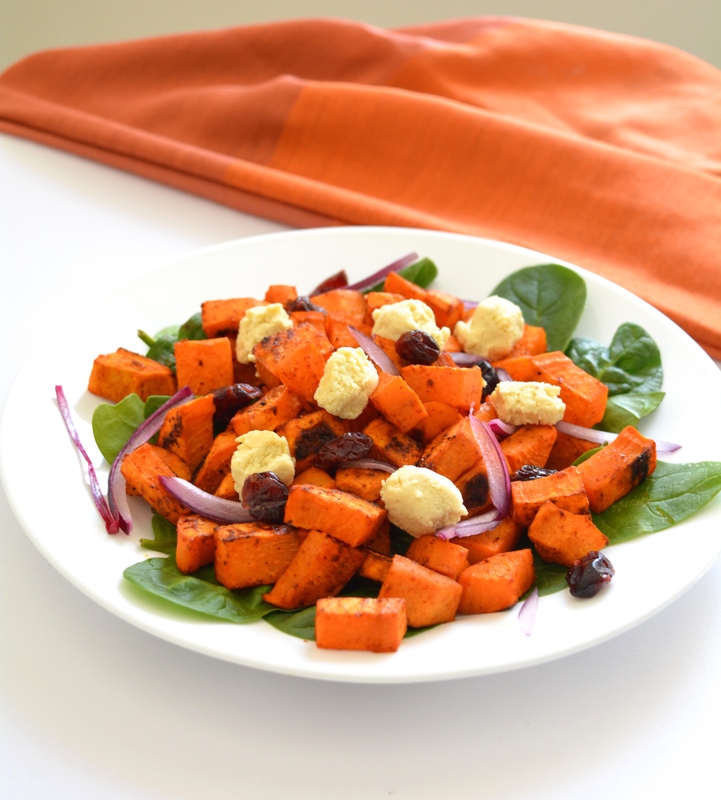 Requires no dressing /you can top this salad with any dressing of your choice. In a pan, heat oil, once hot, add chili powder and salt. Reduce flame to low and roast for a minute. Add cubed sweet potato. 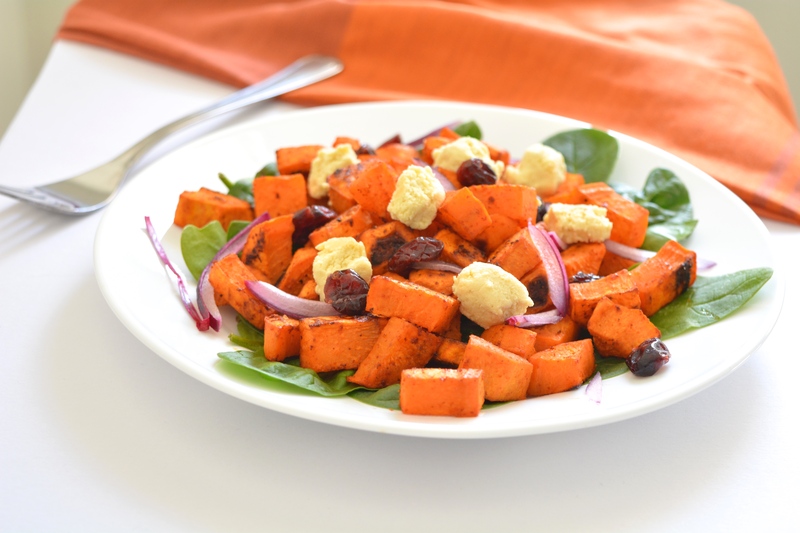 In a bowl, add spinach leaves, over which add sweet potato, crumble almond feta and red onion slices, add dried cranberries, drizzle some lemon juice. It took 30 minutes for sweet potatoes to cook through. Really both oven & sweet potato dependent. Oh I love sweet potatoes, especially baked or roasted. Great recipe, I for sure will give it a try! I havent cooked sweet potato yet charanya…and we get it in plenty here…Now got a recipe…will try it out!! 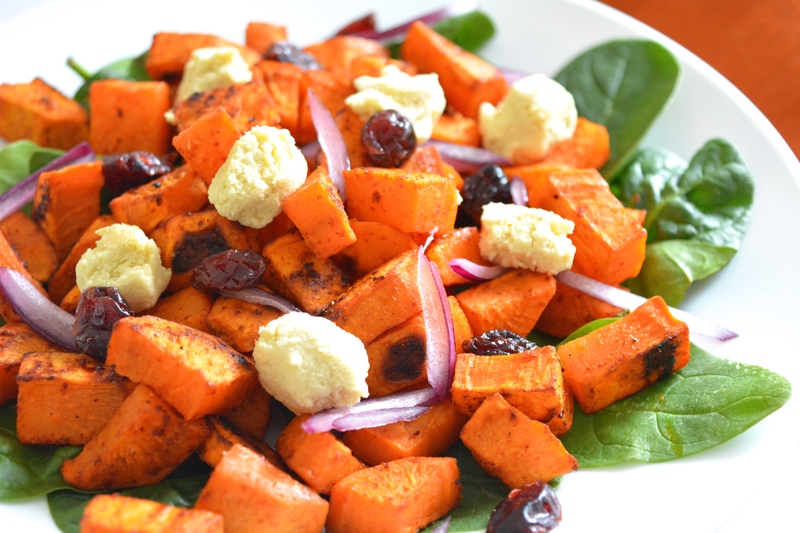 I am not a sweet potato fan, but a salad tempts me.. I try to get as innovative as I can for my dinners.. need more options for salads and greens…. 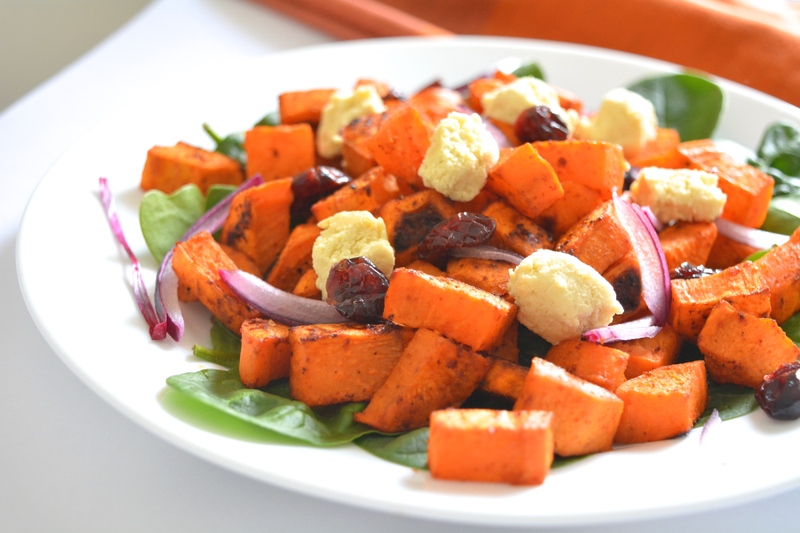 sweet potato seems like an awesome idea. Thanks! This is a new dish for me. 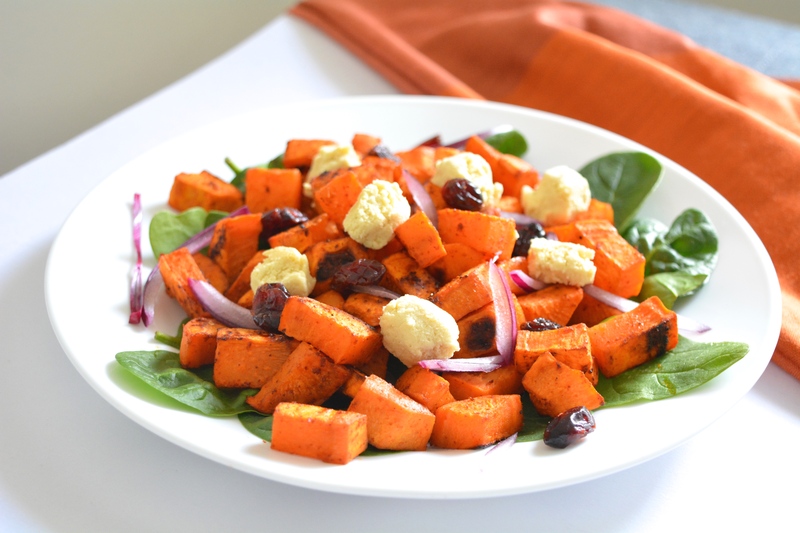 Sweet potato salad is so innovative and i ought to try it soon!! Sure will 🙂 I miss bread heaps too. I have recently found comfort in eating ‘Life Changing Bread’ (Google it up-It is so good). The salad looks amazing! Sweet potato is delicious, isn’t it? 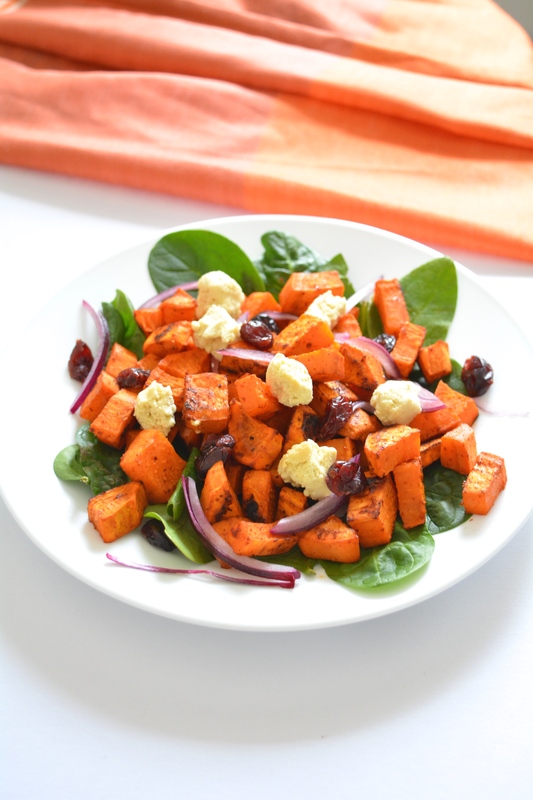 I like it roasted, with some feta cheese crumbled over, so I’m sure I’ll love this salad! Thank you for bringing this to Fiesta Friday! Mmm, looks good! Never heard of almond feta. Where do you buy that? Yum sweet potato is my fave too! 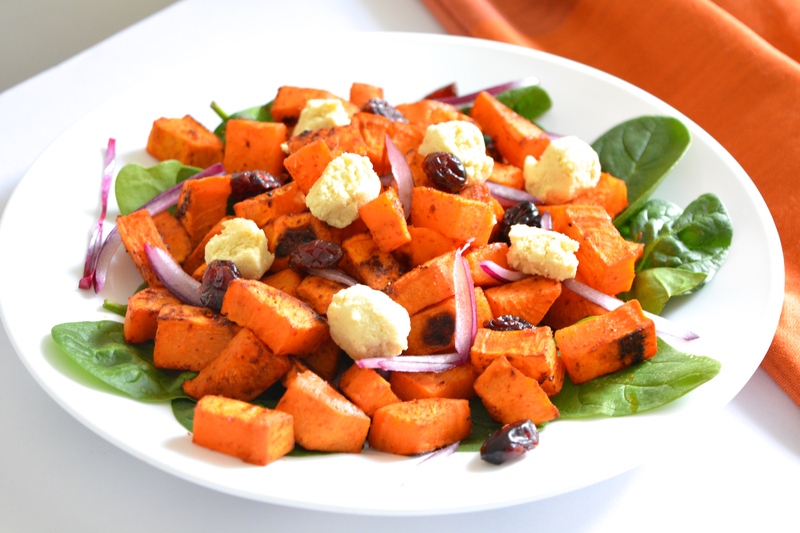 Sweet potatoes are lovely and I love the roasted, Your salad looks delicious 🙂 I agree that dressing isn’t always needed. 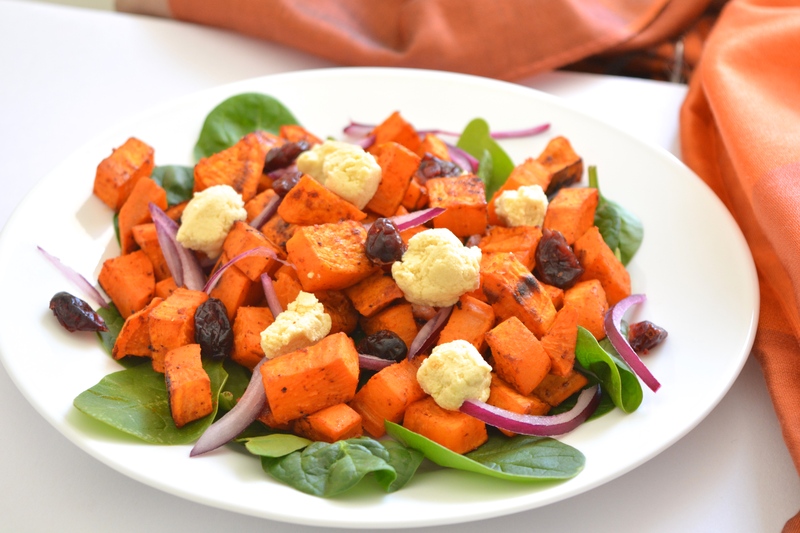 This is making me crave sweet potatoes and fall food NOW!! Yummy!! !